Home » People's Front » Declarations » WE WILL FRUSTRATE THE POLICY OF ISOLATION! OUR THOUGHTS WILL LIVE AND SPREAD AND WE WILL ORGANISE MILLIONS! Up to today, no coup, no encirclement has succeeded in getting us to surrender or be destroyed. Today will be different. WE WILL FRUSTRATE THE POLICY OF ISOLATION! WE WILL TURN AROUND THE ATTACKS AIMED AT DESTROYING US WITH OUR IDEOLOGICAL CLARITY, CORRECT POLITICS AND DETERMINATION TO FIGHT! OUR BELIEFS WILL LIVE AND SPREAD AND WE WILL ORGANISE MILLIONS! The lawyer’s profession will be exercised in that way – we will teach the whole world! Art and culture will be practised in that way – we will show it to everyone! People’s parliaments will be like that, the people will organise their own lives, they will learn to govern and teach others to govern. We will show the whole world once again that the people will succeed! Youth will not be alienated from the homeland and the people; there will be supporters of Dev-Genc! Workers and public workers, you will not be made to give in; there will be resistance everywhere. However thousands of operations you carry out to destroy the “organisation”, however many threats you make that “you will go through the most bitter period in your history,” if you put hundreds and thousands in jail, there will still be an organisation! The organisation is this country itself. The organisation is the people. The organisation is the most rooted hope of this people. You cannot eliminate this organisation without eliminating this country, this people, hope. You cannot eliminate this conception of revolution without eliminating injustice and poverty. You have put 10 of them in jail, and six others have had prices placed on their heads, but with their chorus, children of hope, musicians and orchestras they can be 80 people on stage; they give concerts for 35,000 people. The tens of thousands following them on stage and listening to them are the bankruptcy of the oligarchy’s attempts to destroy them through isolation and terrorisation. We do not say Grup Yorum “was born from the ashes”. Because they did not succeed at all in reducing us to ashes, they are not succeeding and will not succeed. They encircle us, they shoot, the organise repression, they burn and destroy, they break our arms, they put us through their torture centres, they imprison us, they practise an isolation policy on each one of us, developed in an attempt to make us surrender… But again they cannot succeed. Because in every area where they attack, in very supporter of the Front there is a secret “headquarters” they cannot reach. There is our ideology in that headquarters, our politics, our traditions, our values. That is our headquarters. Our headquarters is our ideology. They have gained no result in trying to take that headquarters, whatever the attack they launch. How many times have they practised repression against people’s lawyers in the past few years. How many times have they been imprisoned en masse. One of the contra-guerrilla chiefs, Mehmet Agar, already had said in 1995 that “A number of operational activities have been carried out against the People’s Law Bureau in this connection.” From that day to this the “operational activities” against people’s lawyers have continued. How many times have they said in the headquarters of counter-revolution, “OK, this time we solved it.”… But before they have even uttered those words, a lawyer of the people is circulating in the prisons. The words of the people’s lawyers echo even in the courtrooms. In the headquarters they cannot reach, the steel core they cannot eliminate, the encirclement that does not finish them and they grow and continue to grow. Grup Yorum have emerged as “prison singers” in this country. It is difficult to even count the number of times they have been detained. However many times the enemy has felt pleased to say, we have intimidated them, put them in prison, stopped them from singing, someone starts a chorus of hope, another produces a folk song. Some join, so do others… And again there is a mighty orchestra, a great orchestra that is neither defeated nor silenced. Fascism cannot overcome Dev-Genc. In the end they burned down their building, they burned down the place they started anew… They supposed that they had eliminated Dev-Genc (Revolutionary Youth). In the counter-revolutionary headquarters they supposed that “henceforth we have removed them from the universities and high schools”. And yet they are here and there, Dev-Genc. They strike like eagles, and move ahead as the people’s vanguard. The murderous ministers issue their statements. We will finish the organisation. What they actually mean is the city neighbourhoods. They suppose that after imprisoning dozens of people they can calmly enter the neighbourhoods. It was enough for them to take a step into these neighbourhoods to see that they were wrong… And this is how is it is. Neighbourhoods they supposed to have been silent rebelled, by the thousands, the tens of thousands. They secured their own defences against the fascist attacks. The streets of poor neighbourhoods were lit with the fires of the militias. A People’s Parliament arises from the power of the people, even from another neighbourhood. Despite that amount of imprisonments, encirclements, betrayal by trade unions, revolutionary workers, revolutionary public workers, have lit fires of resistance one by one in the four corners of our country. In places were trade union confederations have fallen silent, hundreds of days of resistance have been organised. The people’s lawyers resist, the people’s artists resist, Dev-Genc resists, People’s Architects And Engineers resist, TAYAD resists, The Revolutionary Workers’ Movement resists, the Public Workers’ Front resists, the People’s Parliaments resist, the People’s Front resists… they all resist and step up the war for people’s power. Why is this picture important? Because this picture shows how a politics designed to get imperialism to make the peoples of the world surrender is being rendered ineffective on the soil of Anatolia. The Reality Of The World: Depression And Hope, Decay And Resistance Side By Side! The reality of our world today when we look at the socio-economic picture we see to be a negative one from a number of aspects. We see hundreds of millions of people have surrendered to drugs and to gambling. We see how widespread prostitution has become. We see how bourgeois ideology and capitalism’s culture of consumption have taken captive the peoples through selfishness and individualism. Without doubt the world is affected by this decay. Broad masses of the people from Europe to Africa, from Asia to Latin America, in a number of places are affected by fascist, racist, religious system parties. A great number of socialist, progressive, patriotic organisations have surrendered to the imperialist world system. But that is just one side of the picture. The other side of the picture is the contradictions in the world and the system that are not resolved and indeed cannot be. There is a struggle of the peoples that cannot be ended. Despite corruption among the peoples, their anger cannot be removed. Despite the mighty economic, military and police forces of imperialism, there are revolutionaries who cannot be made to surrender. Means a great danger for imperialism. From imperialism’s point of view it is important because of the politics it has, not the power of the organisation, not how many guerrillas it has. Isolation is when a person, an organisation or a country have their ties to their natural environment cut. That person, organisation, country are to be surrounded and isolated, politically, militarily, economically and culturally. Isolation is a policy of imperialism. The aim has two stages. The first aim is isolation. By rendering them alone they seek to achieve surrender. Isolation is a stage on the road to surrender. 2 – Isolation is essentially ideological and political. Physical, military and economic isolation are supplements of the political isolation. Practised in a form taking two directions. What does it mean, to terrorise? It is the policy of showing organisations as “terrorist organisations”, individuals as “terrorists”, countries as “producing terror” or “supporting terror”. Counter-revolutionary terrorisation mechanisms work in this way: previously they lodge in minds the propaganda that “terrorism is bad”. Then they attach the “terrorist” stamp to targeted organisations, people and countries. After that point it is seen as “normal” to apply every kind of repression, ban, punishment, death and tyranny to that person, organisation or country. The policy of “terrorise and destroy” by imperialism and collaborationist fascist governments took on its content decades previously. They started announcing that revolutionaries were anarchists and bandits. Since the 1990s this propaganda became more intensive, and they developed concepts of “terror” and “terrorism”. Particularly since the start of the 2000s, the USA and European imperialism have been using terrorism lists in a more systematic way. Previously “lists of terrorist organisations” were published. Later this was narrowed to “the most dangerous terrorist organisations”. “Terrorist” lists containing names of individuals were published. And finally there were “countries supporting terrorism” and in one way or another all who came out against imperialism, people, organisations or countries, found their way onto the lists. The policy of isolation reached a new stage at the start of the 2000s. Isolation and terrorising were united at this stage, and were set in motion with the biggest prison massacre in our country on December 19, 2000. This isolation is directly aimed at the Front. Because the Front, following the tearing down of the socialist system, represents not abandoning socialism and not abandoning the fight against imperialism when all the world has given up claims to revolution. On a world scale the biggest barricade in front of putting an end to revolutionism is the Front. Later on, the representatives of the oligarchy admitted that the primary goal of the December 19 massacre and the F Types was to destroy the organisation. They did not succeed. But the policy of isolating the Front and trying to terrorise and destroy it continues. The imprisonment operation carried on against the Front since September 12, 2017 is the continuation of this policy. The forms this policy takes in our day is the bans on Grup Yorum and on lawyers of the people and People’s Front forces in our country but also extending into Europe. Yesterday this attack was beaten off with 122 martyrs, persistence in armed struggle and in the democratic struggle. Today we confront this policy with our ideological clarity and determination in the struggle. Today various sections place exaggerated emphasis on the contradictions between AKP fascism and the USA and EU. They are starting to have expectations from imperialism in the struggle against the AKP. This must not be forgotten: the most important aspect of imperialism’s political, military and economic policies regarding Turkey is determined by the stability of the oligarchic system. Imperialism does not want this stability spoiled by the revolutionary struggle and people’s movements. This is why the F Types were put on the agenda and why the USA and EU are behind all isolation policies targeting the people and the revolutionaries. Again we are present in every area of life with this determination. OK, what happened to those who did not resist isolation? During the Great Resistance of 2000-2007, in which we gave 122 martyrs, we were not just up against imperialism and fascism. The attack soon was transformed into an encirclement. One side of the encirclement was by imperialism and collaborationist fascism. And this was natural. But the other side of the encirclement was made up of Kurdish nationalism, reformism, European Union supporters and opportunism. The F Type prisons were opened to liquidate the Front and the massacre they resorted to was a tool for intimidating all sections of the opposition and masses of the people, and this policy resulted in making all reformist and opportunist sections come a little deeper inside the system. Why was all this so dominant? Because their brains were guided by the bourgeoisie. After the declarations of Sadettin Tantan, Hikmet Sami Turk and so on following December 19, they too said the organisation was in the process of being finished off. They said our coffin was nailed up. History would show that it was their own. It is the left that has died. Political death. Ideological death. Brain death! Before 2000, the left functioned, even if in a very limited way. And today? What has remained on May Day other than the TKP holding their separate celebrations? Where is the TKP-ML line today, which kissed the foreheads of traitors and was eager to show that the resistance was “defeated”? Parliamentarism, tailing the PKK, guerrillas who hold their hands in the air as they surrender, it is no longer Kaypakkaya they follow, but conciliation and surrender. Others who have fled from the resistance are the MLKP, who do not know how they can take refuge inn Marxism-Leninism while receiving weapons from the USA and engaging in collaboration with the USA, not how to reconcile this with Communism. But we do know that they have no connection with this land any more. Even their “martyrs” operate from US bases, from the schools of French imperialism, and with Italian units, US and French generals train the YPG, equip it, all in a square with their flags flying overhead. This is the picture the left in Turkey presents today. Today some among the reformists and opportunists have hopes in the CHP “vanguard”, many tailed the HDP’s entry into parliament and some even made it through the doors of parliament in that way. They are finished, having no political future other than to play the parliamentary games of fascism. There are three sources for the tendency to surrender. Imperialism is supreme: their minds are gripped by the impossibility of resisting it. Despite their arms and mass base they have lost all claims to power, they have lost the belief that revolution was possible. Having rejected belief in the truth which is that only socialism can solve all the problems of the peoples of the world, they have no future. Like FARC in Colombia, ETA in Spain, the IRA in Ireland, the Tupamaros in Uruguay, the ELN in Bolivia, the ANC in South Africa, the URNG in Guatemala, the FMLN in El Salvador, the PKK in our country, these are the reasons they gave in to imperialism. They changed clothes to enter the fascist parliaments in their countries. For imperialism and the oligarchy, it is not enough for all these forces to put their hands in the air. They want much more. They want revenge for all the years of fighting. They want to wear them down and drag them along the ground in front of all the peoples of the world. They want to show through all the leftists who gave in that the struggle of all the peoples of the world is in vain, and achieves no result; they want to destroy the hope and morale of the peoples of the world. But at this point we are here. In the world today, we are the only ones fighting for independence, democracy and socialism and against imperialism, fascism and capitalism, and not seeking conciliation with imperialism. The peoples of the world and left of the world see us. Our ideological clarity, our correct politics in practice and our refusal to be defeated despite all repression is a source of morale in all four corners of the world to revolutionaries, progressives and patriots. We see this shown clearly on the international plane in the concerts held by Grup Yorum in various countries. Two workers out of tens of thousands thrown out of work under the state of emergency decided to resist the decision. The two resisters, Nuriye and Semih, had to be isolated… Terrorised and eliminated. 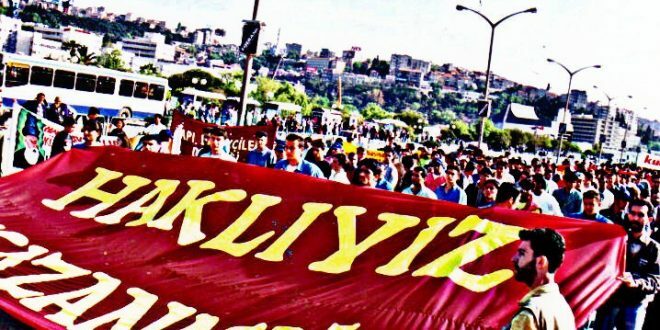 “They are being incited and made use of”, “they are following the instructions of the organisation…”, “both of them are DHKP-C members…” According to the DHKP-C being terrorist, it followed that everyone should stay away from them… Despite this, fascism could not prevent a growth in solidarity around them, and to win credibility for the policy of intimidate it put both resisters in prison. To give some credibility to this claim fascism imprisoned 11 Grup Yorum members and put prices on the heads of six more. The oligarchy could not isolate the resistance of them and of Nuriye and Semih. Nor was announcing them as terrorists credible. The policy of isolating Grup Yorum members was turned on its head. The artistic front and the people alongside Grup Yorum grew. We remained upright as they tried to encircle us and came out of this stronger. Our People And All The Oppressed Peoples Of The World! The Left In Turkey And All Revolutionaries And Patriots Of The World! And we can defeat imperialism! Those who say “the USA is sovereign, it is necessary to give in” cannot say the truth about the people and revolution. They want to legitimise surrender. 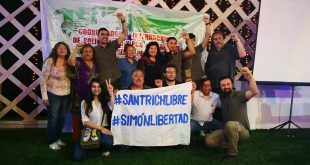 After decades of armed struggle, they sit down to dinner with the bourgeoisie, go to the “peace” courts of fascist governments, and do not represent the hopes and future of the peoples. They are henceforth on the road of betrayal. The peoples of the world will abandon them on the road of betrayal. Of this we are confident. The world’s peoples will walk again on the road of national and social liberation. We can frustrate imperialism’s policy of isolation. We can turn on its head imperialism’s policy of “terror lists” aimed at terrorising and destruction. Today against all repression and terror, all the resistance we practise shows how fore-sighted this was. Imperialism wants to conquer our minds with isolation and terrorism demagogy. Those whose minds surrender, surrender everything. Imperialism can be resisted and imperialism can be defeated. No force, no politics, no demagogy can remove our historical rightness and the inevitability of revolution and socialism. The first is that it is historically necessary to tear down the existing system and put in its place a new one. The passage from primitive society to slave society, from slave society to capitalist society, was historically necessary and the same historical necessity applies to passage from capitalism to socialism. Second, revolution is necessary so the working people can achieve their rights, national, social and class, and create a society they can live in without exploitation, repression and tyranny, which can be achieved by tearing down the old system. This is right and just. WE WILL RESIST and we will fight; WE WILL GROW and in growing WE WILL BUILD UP RESISTANCE AND WAR yet further. By ORGANISING millions we will use THE UNBEATABLE FORCE OF THE PEOPLE TO MARCH TO VICTORY! The Bloodiest Organisation Is The Fascist State. The founder and chief practitioner of the policy of isolation and terrorisation on a world scale is the USA. But the truth is that if there is a force in the world that needs isolation, it is American imperialism. Secondly if you talk of “terror” in the world, American imperialism is the first. No country or organisation actions can be compared to what the USA has practised. In 68 years from the Second Imperialist War to the present 21 countries have been occupied. American military forces over two centuries have killed at least 30 million people, according to official figures. In 2016 900 billion dollars were spent on weapons in the world; of this 596 billion dollars were by America. These weapons are for terror against the world’s peoples. According to the US Department of Defense, in 157 countries there are 702 American bases or signs of military presence. The reason for this presence is war on the peoples. The American armed forces possess 9,400 nuclear weapons. NATO-USA have 28 bases in 26 of our provinces. In conclusion American imperialism is responsible for the blood and sweat of the peoples. All military operations and attacks by American imperialism are terrorism attacks aimed at frightening and intimidating the peoples of the world.